We have sold hundreds of ladies dresses, and we listen closely to customer feedback to make sure we're delivering on the promise of unique, authentic clothing, world class service, and great prices. We survey every customer to gauge their opinion of the products they bought, and put together this list of the top-ranked ladies dresses in our store. Shop with confidence, knowing that these terrific ladies dresses have been tested and endorsed by our other customers, and that you will receive five star service along with a great value! This dress is for my granddaughter and I hope she likes it. The material is a little heavier than I expected which is a good thing, will update when my granddaughter tries it on. This dress is precious. It is extremely wearable and comfortable. I love the buttons all the way down the front! The color is lovely. I am thrilled with the quality of this dress. It is a perfect costume for "Miz Lottie" a sassy frontier woman. Great buy! Very authentic. Like the real thing!! 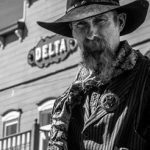 I am a book cover illustrator, and I often use costumes for the illustrations I do. This one worked out perfectly! I have been looking at this dress for awhile. Had to get it. Wonderful color, quality and style. I'm sorry I waited so long. I was not expecting this dress to be quite so beautiful as it is. The fabric hangs so perfectly and blows just great in the breeze, while still being very durable. One of the button holes needed reinforcing, since it kept coming open, but otherwise this dress is far better than I expected in all ways. And that is not to say I had low expectations, I just thought for the price, it was not going to be QUITE this nice. I really like this dress. It looks like a dress from the 1830's. Next month I'll be wearing it along with the Muslin Bonnet in front of the Alamo in San Antonio. I'm part of the Daughters of the Republic of Texas, and we are doing a presentation to celebrate the independence of Texas from Mexico. The dress is made well and looks very authentic. This dress fit perfectly right. I am a size 10-12. I am a guest speaker for women's groups and it was just right for late 1800's topic. Very happy with the pioneer dress, the fit was perfect, except I had to take up the shoulders, thankyou and I know I am going to enjoy wearing it to our annual Blockhouse opening of the locks in Merrickville, Ontario, Canada! I haven't tried it on but it looks great in person. Can't wait to wear it to a shoot. This is a very pretty and well-made dress! The price is great! I intend to wear this all the time. I'll be back for another color! Thanks Historical Emporium! I had to buy a large when I usually wear medium. However, with alterations at the shoulder seams and shortening the sleeves, the dress fit me fine. The dress came down to my ankles since I am short. I wore it for the function for which I needed the dress - 1840s time period and receved several compliments both on the style and fit. LOVE this dress. Personally this is something that I will be able to wear all the time. The quality is excellent. This is not like a costume at all, but is a great dress. For me this fit true to what my size normally is. I originally sized up using the measurements but then needed to exchange for my usual size. Exchanging was quick and easy. Excellent quality. Accurate sizing. Great value. I purchased the print pioneer dress. It is so beautiful and I love the five button ribbon on the cuffs. I have received many compliments on this outfit. Well made. True to size. I bought this to have an extravagant dress for my 21st birthday. And it was beautiful. It came sooner than I even needed it to. It couldn't have been better. The quality of this parcel is more than excellant. Fit extremely well and was comfortable. I was very impressed with the quality. Exactly what we were looking for. Perfect for a saloon girl or soiled dove. Good construction...not a costume, but an actual garment. Absolutely what I was looking for a pioneer presentation.... Perfect for the non sewing person-me! Beautiful, authentic dress. We will be using it in an event at our History Park Museum. True to size-chart size. I'm trading a medium for a small. (Size 4) It has lot's of material over-all, and is plenty long for 5'7". I bought this for my girlfriend as part of her Halloween costume. I ordered it online and had it in four days, I was amazed. She loves it! it fits exactly as described and is beautiful. It was not expensive but the craftsmanship and quality is exceptional! The dress is beautiful and very well constructed! 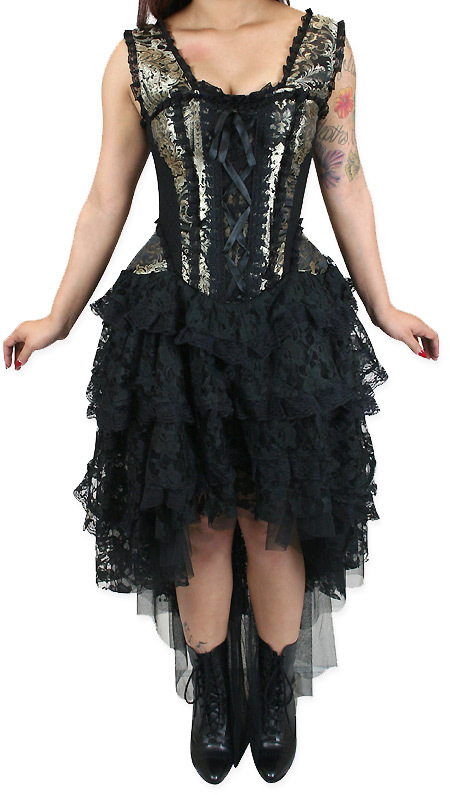 I bought this dress for a steampunk party! Easiest costume ever! It looked GREAT paired with a hat and some high-heeled boots. You can't go wrong with this dress - it's a great easy costume you can mix and match to make a few great looks. Plus, the bodice is VERY forgiving. I sized up one size just for luck, and I am never worried about what I eat (or ate!) when I wear this dress. Love it! Stunning outfit, sizing it correct. Looks good with or without hoop. This is made well with sturdy material. Being 5' 1" I was afraid of it being too long, but a turn of the waist brings it up enough. Be aware, dry clean only. Very lovely and comfortable to wear. I am delighted with the appearance and fit of this dress. Comfortable flowing fabric. I imagine the white might be a bit translucent, but the black is fine without a slip. Will probably by another if they come back in purple or blue. The front has laces that can be snugged a bit if desired and the back has a square neckline with elastic gathers on the bodice. Fits me well with 38" bust and 34" waist. BTW, I accidentally put it on backwards and it is actually kind of cute like that, looking more Regency. I was very pleased with my order. The dress fit me perfectly and I loved how I looked in it. Persephone cap sleeve dress was gorgeous! Absolutely love it, fit perfect. 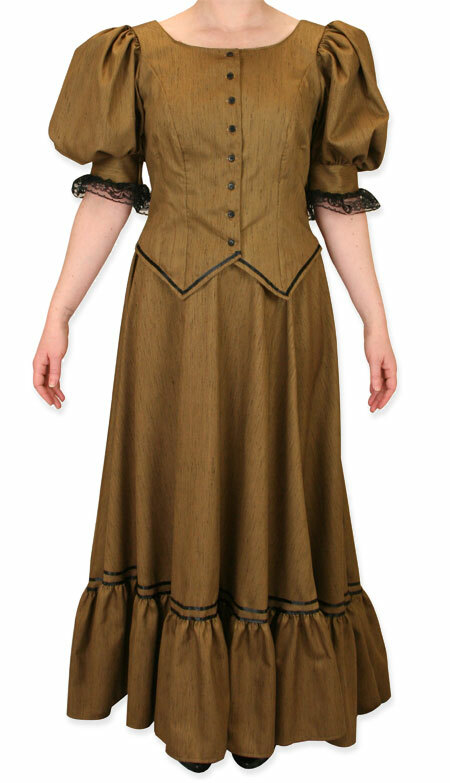 I bought this dress because I was going to be a guide for a Victorian House tour. It arrived on time, fit great, and was very comfortable. wearing it to a Downton Abby party = is perfect!!! I really like the style of this dress and it would have worked great for our "era" party fundraisers. However the color was listed as ivory and when I received it I thought the color was terrible. Not really ivory but a washed out tan/pink color. I returned it. Love this little dress! Quality way better than expected for the price. Perfect for my Pirate wedding! Beautifully crafted dress with attention to detail. Of special note-- I am usually a medium in women's clothes. Due to my largest part... I am an extra large in this dress. Pay attention to the size chart when ordering. Once in the correct size according to the size chart--- the dress is fully and separately adjustable in the bust, waist, and hips with the satin corset lace in the back. May fit a variety of body types "just right". 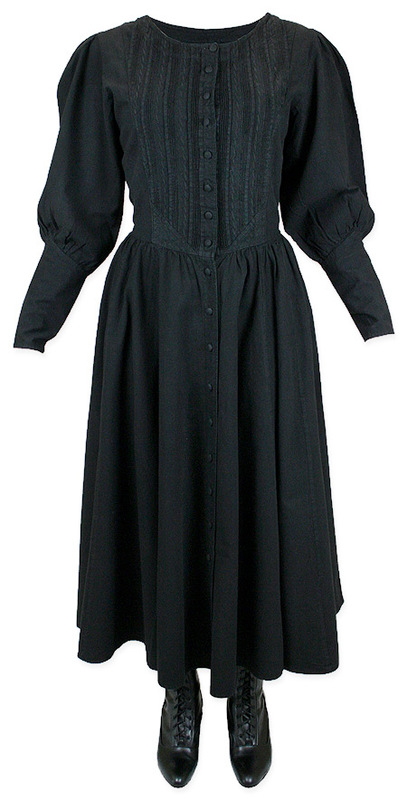 I purchased this for my daughter for a period costume event. The event has not happened yet, but am extremely pleased with the quality and the fit if the dress. We will shop here again. The dress showed up sooner than expected, I was delighted just with how it looked on the hanger, as well as the quality. It fit wonderfully and was very comfortable. I have received a constant stream of compliments whenever I wear it as well. I love everything about this dress! It is beautiful, durable enough to be a regular wardrobe price and very flattering. 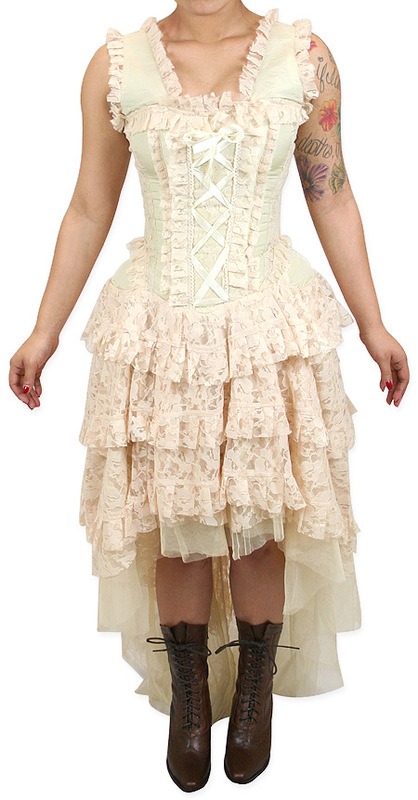 I bought this to wear as my wedding dress. The sizes run a little small, but it looks amazing on. I absolutely love this dress and can't wait to wear it on my wedding day!!! This dress was purchased for my daughter's upcoming high school Prom. She absolutely loves it.It was even more beautiful than we thought it would be. The quality is outstanding and the fit was perfect. Her friends think it's great.She looks and feels beautiful,what more could a Mom ask for?! I bought this dress for a part of my Halloween costume this year and LOVED it! Very pretty, very well-constructed and I felt well worth the money I spent. I actually found the same dress in another store for a much higher price after I had already purchased it. I received so many compliments. It was, however, sized I thought about one to two sizes small, but the corset works well so it was all A-OK. The shipping speed was also lightning fast! Great customer service! Service was great. It arrived very quickly. Thank you. the bow tie and handkerchief came quickly and I am very pleased with them.